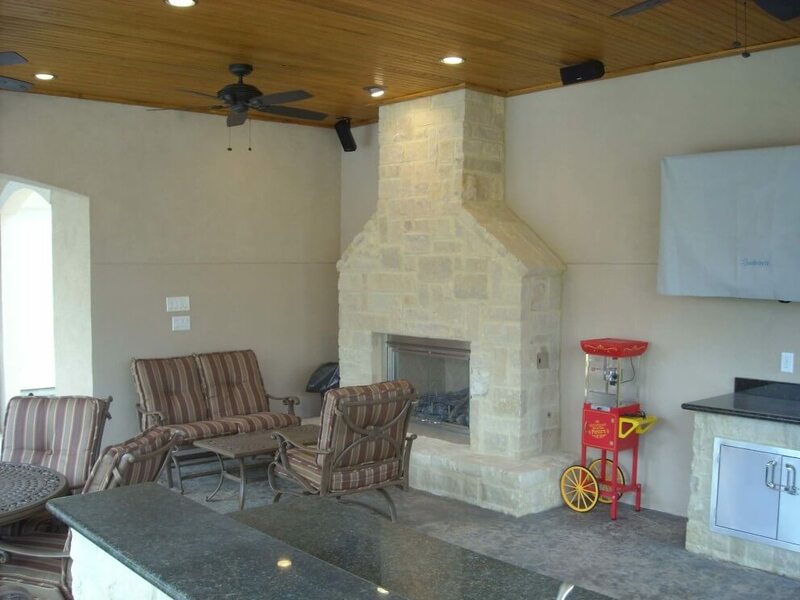 This stucco pool house was designed to be a freestanding patio cover and to look original to the home. To meet HOA requirements for this large structure, it needed to be attached to the home. The foundation was poured with a raised elevation and a different color of stamped concrete to set it apart from the pool deck. Space is plentiful for grilling, entertaining, dining and conversing by the fire. The patio cover has a complete entertainment package, including television and speakers. Recessed lighting, directional lighting, decorative column lights and ceiling fans accent each area within the space. This kitchen includes a raised bartop, large grill, sink, trash drawer, refrigerator, ice maker, a separate buffet, and plenty of storage. The fascia of the kitchen is a Texas limestone. Counters are granite. The fireplace has a gas log set and turns on and off with a flip of a switch. Stone fascia is a limestone with some nice color variation.